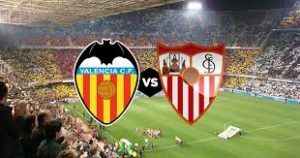 Valencia hosts Sevilla in a game from the 15th round of the Spanish La Liga. Let’s take a look at this game at the Estadio Mestalla in the city of Valencia. Valencia are doing worse than they did last season. Los Che are currently 14th in the standings with 17 points won and a record of 3 wins, 8 draws and 3 defeats. This explains why Valencia are on such a position in the league at this moment. They made too many draws since the beginning of the season, which is the reason why they can’t climb up in the table. In their last five games Valencia won twice, lost twice and made one draw. Another sign for their inconsistency. In their last game Marcelino’s boys suffered a 0-2 defeat during the visit to Real Madrid at the Estadio Santiago Bernabeu. The Austrian defender Daniel Wass scored himself an own goal, while Lucas Vasquez decided everything with a second goal 7 minutes before the end of the game. Before this defeat in the capital, Valencia enjoyed two consecutive wins against Rayo Vallecano and Getafe. Last season Valencia enjoyed a Top 4 finish and a qualification for the Champions League, but now the situation does not seem so bright for them. Sevilla are doing much better than their next opponent at the moment. Right now the Andalusians are 2nd in the league standings, only behind the leader Barcelona. Right now Sevilla have 27 points and a record of 8 wins, 3 draws and 3 defeats. In their last five games Los Rojiblancos are unbeaten – 3 wins and 2 draws. In their last game Sevilla made a 1-1 draw during the visit to Deportivo Alaves. Jony opened the score for Alaves, but Wassim Ben Yedder equalized for Sevilla, securing the point. That’s what we had to say about the La Liga clash between Valencia and Sevilla. Good luck!